Regular readers of the Everyday Tourist blog know I love to flaneur i.e. wander aimlessly the streets, alleys, parks and pathways of Calgary or any other city where I might be. Recently I was in Hamilton, visiting my Mom and found some time everyday to flaneur the streets of what use to be Steel Town but is now affectionally known as The Hammer. As I wandered, I was surprised at how often I felt like I was back in Dublin, Nashville, Memphis, Leipzig (Germany) or Kreuzber (Berlin). I love shop owners who extend their stores out onto the street. Kudos to Vintage Soul Geek, International Village. 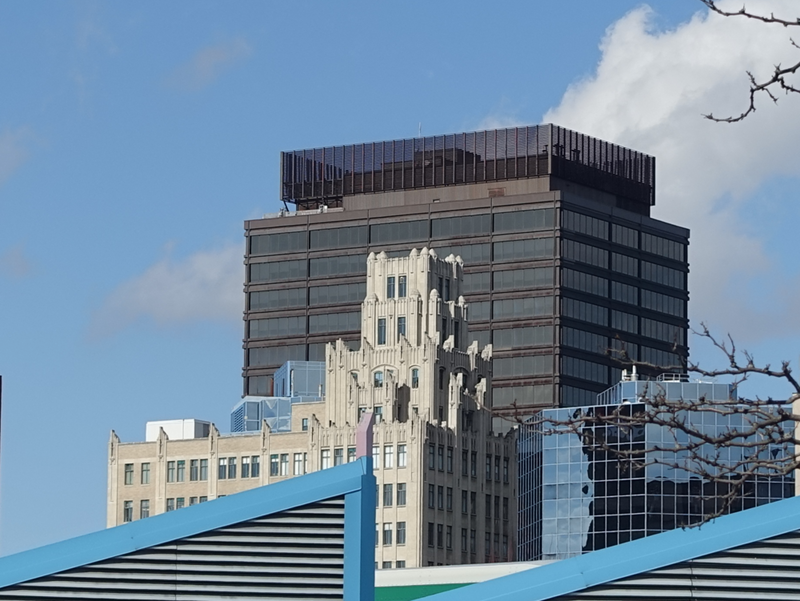 While visually you couldn't get two City Centres more different than Calgary with its glittering glass office and condo towers and Hamilton with its redbrick low-rise buildings, surprisingly there were lots of similarities. Hamilton's Locke Street had many of the elements of Calgary's Inglewood, before it became gentrified. Hamilton's Durand with is charming brick mansions reminded me of Calgary's Mount Royal, without the new mega homes. Hamilton's Corktown with all of its live music venues had many elements of Calgary's Inglewood. Hamilton's International Village with its colourful storefronts reminded me of colourful facades and a doors in Dublin. Hamilton's James Street North had elements of Calgary's 4th Street and Kensington Village, as well as urban grit of Kreuzberg. I thought since I had so much flaneuring fun I would share it with you as a photo essay. Fun sandwich boards are a great way to enhance the pedestrian experience. Kudos to House of Java on James St. S.
There should be awards for stores with the best names and signage. 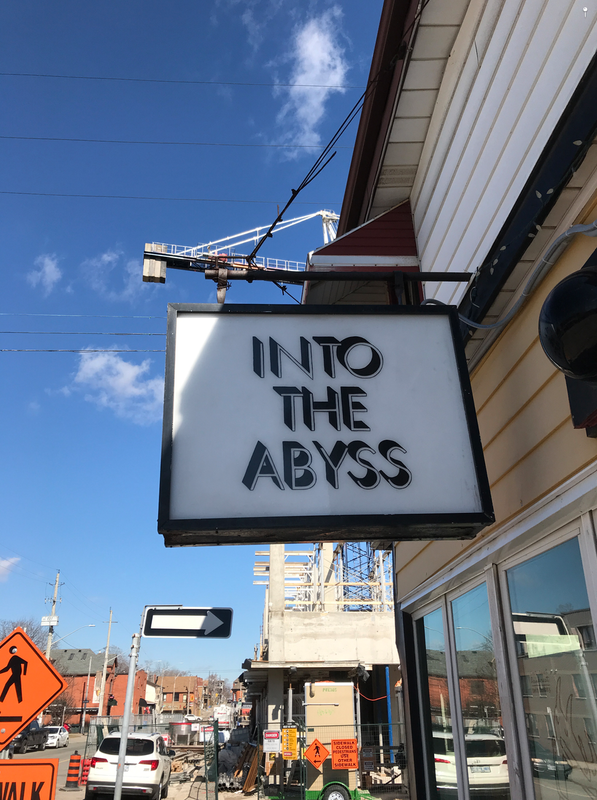 Into the Abyss is a record store on Locke Street. Dr. Disc was a great find...loved the fun display in the stairwell...be sure to leave some time to search the 3 for $1 records. Empty storefront becomes an exhibition space on James St. N. Why doesn't every landlord with an empty window space do this? Jane Jacobs would love the urban clutter along Locke St.
One of the strangest things about Hamilton's City Centre is the number of scooters you encounter. They replace the mega strollers of cities like Calgary. Somehow it seemed ironic that there were all these signs saying "Stop For Pedestrians" but there wasn't a pedestrian (other than me) anywhere in sight. I was surprised at how many great window displays there were in downtown Hamilton stores. 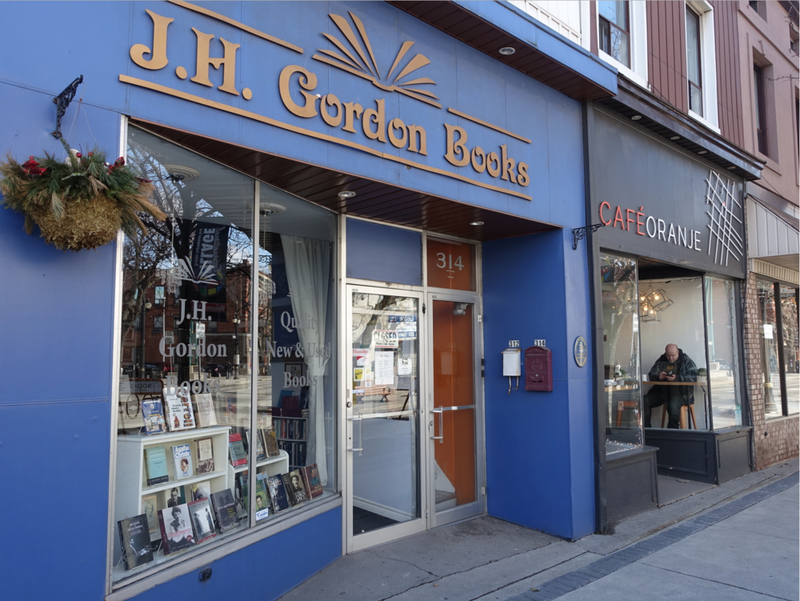 I was also surprised at the number of independent used bookstores in Hamilton's City Centre - another sign of a healthy community. Inside I found intriguing vignettes. Hamilton's City Centre is full of funky coffee shops with great windows for people watching. This could easily be in Dublin or Berlin. I want a craft beer kitchen in my neighbourhood. Hamilton's City Centre is full of small boutiques. If you are in Hamilton on a Tuesday night, be sure to check out the Irish Jam at the Corktown Pub. It was as good as anything I experienced in Dublin. At one point I counted 23 musician jamming at the same time. The Corktown pub also has great blues jam on Sunday afternoons. It reminded me of being back in Memphis at the International Blues Competition. Hamilton's Mississippi Queen aka Connie (FYI: she owns the Mississippi Queen restaurant in Hamilton and is from the delta) was at the Blues Jam entertaining everyone with her dancing. If you are into guitars you will want to check out The Acoustic Room on James St. N, near St. Joe's Hospital. Yes, they only sell acoustic guitars. It is like an art gallery for guitars. The Cat "N" Fiddle reminded me both of Dublin and Nashville. Dublin because of the architecture and colours, Nashville because the bands playing in the front window. I am thinking Hamilton must be the neighbourhood pub capital of Canada. In Hamilton any house can become a pub. Ever since the two-year old new door introduced me to the joy of "night walks" I make a point of flaneuring at night when I am in a new city. Brightly coloured rooms are all the rage at trendy contemporary art galleries today. In the past year I have seen "Colour Room" exhibitions at the Esker Gallery, Calgary; Palm Springs Art Museum and one of the galleries at Leipzig's Spinnerei. In Hamilton, you don't need to go to an art museum to see contemporary art just wander the streets. There is an interesting narrative here, as all of the chairs are faced to look out onto the street. It is as if they are starring at you. I passed by this alley many times during my stay. Something about it fascinated me. The note on the door says "you won't know unless you come it." Inside, you will meet Pat who sells everything from vintage typewriters to books, from pens to rubber stamps. It is a hidden gem. Perhaps Hamilton's best one two combination...a great bookstore beside funky cafe...it doesn't get any better. Unless it is the Thrifty Designer and a flower shop. The Burnt Tongue has great soups (as well as a great name). Next door is Smalls cafe (it has just one seat to sit at the window). Choises Musicales aka Musical Chairs is a fun vintage boutique. All along the sidewalks of Lock Street are fun word plaques that make you stop and think. Wow - fun, clever and inexpensive - public art! Thought Hamilton's downtown there are amazing relief artworks form the early to mid-20th Century. I am thinking we need to bring this kind of public art back. This brutalist parkade comes alive at night with light and colour. How simple, effective and affordable is that. Love this collage of old and new architecture. Hamilton's Gore Park is an eerie spot at night. This artwork/signage seems surreal in the deserted space. This barn-like sculpture outside of the Hamilton's Farmers' Market adds a sense of playfulness to the pedestrian experience. I love contrast between the chaotic lines of artwork and the ordered linear lines of the market windows. A nice metaphor for entropy of urban living. I don't know if it is true, but it seemed to me that there are more churches per block Hamilton's City Centre than an other city I have visited. When I first saw this piece I thought it was a real person sleeping on the bench. This is outside St. Patrick's Roman Catholic Church. This could easily be in Kreuzberg a neighbourhood in Berlin that has been called the best hipster community in the world even though it is the dirtiest community (graffiti and litter everywhere) I have ever visited, that wasn't a slum. It is a haven for artists from around the world who love the bohemian lifestyle. The same is true for parts of Leipzig, two hours from Berlin that is also a haven for artists. Found this on the window of a door along James St N. How cool is this as an artwork? Found this on the hoarding (plywood walls) at construction site, it too could be in a contemporary art gallery exhibition. Another doorway artwork that would be at home in Kreuzberg or in a contemporary art exhibition. I wonder what is the connection between Hamilton and Franz Liszt? This looks like a checklist of what any urban planner would tell you a City Centre needs to be vibrant place. And yet, Hamilton's City Centre struggles to attract the right mix of live, work and play elements to foster urban vitality. It is obviously not for a lack of trying. And yes, Hamilton (home to Tim Hortons) has a trendy boutique donut maker. Monster is located at the south end of Locke Street.